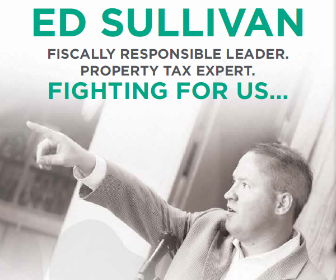 State Represenative Ed Sullivan - who we've covered here at the Truth Team before (you can find all of our Ed Sullivan coverage here) - is taking the fight for his State Representative seat to the street. In a call-to-action, Sullivan documents his approach to public service, details his background, and encourages voters to join his team. As a Mundelein resident, it has been a huge honor to be able to serve my neighbors in public office. I was raised to value public service, and it is that upbringing that taught me that holding elected office is a sacred duty of service to the public. I am currently serving my sixth term in the Illinois General Assembly where I have built up a reputation as a fiscally-responsible leader on budget and property tax issues. After receiving a B.A. in History and a B.A. in Political Science from the University of Illinois, I was elected as the Fremont Township Assessor. As Assessor, I travel throughout the region educating homeowners on how to navigate the complicated appeals process to ensure they are getting a fair assessment on their homes. I am a graduate of Carmel High School and am proud to represent my hometown of Mundelein in Springfield. My wife, Trish, is a Family Nurse Practitioner. We reside in Mundelein and attend Saint Joseph Catholic Church of Libertyville. We have two children: our daughter, Kaileigh, and son, Edwin (Finn). We have an eight-year-old Yellow Lab/English Bulldog mix named Storm that we rescued from Ocean Springs, MS on an animal rescue operation three days after hurricane Katrina. I take my responsibility to serve you seriously and am grateful for the opportunity. Please let me know how I can better serve you. And, if you are willing, consider joining our team so that we can continue to fight for fiscal responsibility in Illinois. We need more people like you in your neighborhood. Want to help Sullivan? He has a link to his sign-up form on his website where you can get in touch. Get after it!